The next time I woke was with the alarm at 5:00, so obviously my worries about the bivy bag were unfounded. For the second time in this race I had slept for 8 hours, but this time I didn’t have much of a guilty conscience since I needed every bit of rest I could get: The next two days would be almost as brutal as the last one. The beginning of the climb up the Albulapass was very cold and eerie due to the huge shreds of mist wafting along the mountainside. However the gradient kicked up soon after and the sun peeked across the mountaintops so that I got warm again in no time. I was very pleased with myself thanks to the successful day yesterday and because I was still ahead of schedule, which was very satisfying because I have had a very hard time estimating my performance in the mountains. My moods reached new highs when I arrived at the top after four hours of continuous uphill. The view on the plateau wasn’t even that stunning, at least compared to the ones yesterday. But in contrast to the hordes of tourists and bikers on these passes, it felt very solitary and calm up here. This allowed me to unwind a little from the constant pressure of the race. After relaxing my mind for a little, I got flooded with huge waves of gratitude and appreciation for this whole endeavor, starting with the small things like that I still was in such a good shape and would likely be able to finish the race. But also I felt very thankful that Mike Hall and the other organizers chose this difficult course and shied away neither from two alpine checkpoints, nor from the Balkans and Turkey, even though there was some pushback from the racers due to safety concerns. I certainly wouldn’t have dared to choose this route as a challenge on my own. On top, I appreciated the immense support I had received from my family, enabling me financially as well as mentally to go on these kinds of adventures. I’m a person who takes all of these things for granted way too easily, or thinks he’d be fine without them. But riding on what felt a little like the top of the world gave me some necessary distance to take a more considerate view on how absurdly lucky I was to be there. These emotions endured all the way through the descent into the Engadin valley, where I got reminded of a kayaking trip adolescent me had done in this area years ago, offering me some more perspective on how far I have developed in the years prior. I got distracted from my feel good trip down memory lane when I met Team 215, Daniel and Michael, in the last supermarket before the next climb. It was funny watching them roam through the shelves, trying hard to decide with a foggy mind which items to buy for the next hours on the road, appearing as out of place as I always felt. So they ate as some right there, whilst I tried to finish as much of the six-pack of ice creams as possible before they all melted, and in between munching we shared stories of the past days. After this happy get-together for lunch, I started to pedal up the next climb. At this point I wasn’t even disturbed anymore by the thought of riding uphill for hours on end, this was just another occasion to enjoy riding at slow speeds, having the time to look around the surrounding forests whilst again listening to podcasts. This time I was entertained by an episode from The Bike Show about Chris Boardman, apparently a very accomplished professional rider (of whom I had never heard before since I have no clue about pro cycling 😀 ). But during this episode he read a chapter of his biography in such a charming and funny way, that I immediately earmarked it to buy it from Audible as soon as possible. Once at the top I was looking at over 100km of downhill, at the end of which I would be in Bozen. The area around the city was familiar territory to me, since I had scouted it on two longer training rides a couple of months prior. Additionally I would meet Elia there, a friend I met during my exchange semester in Norway. 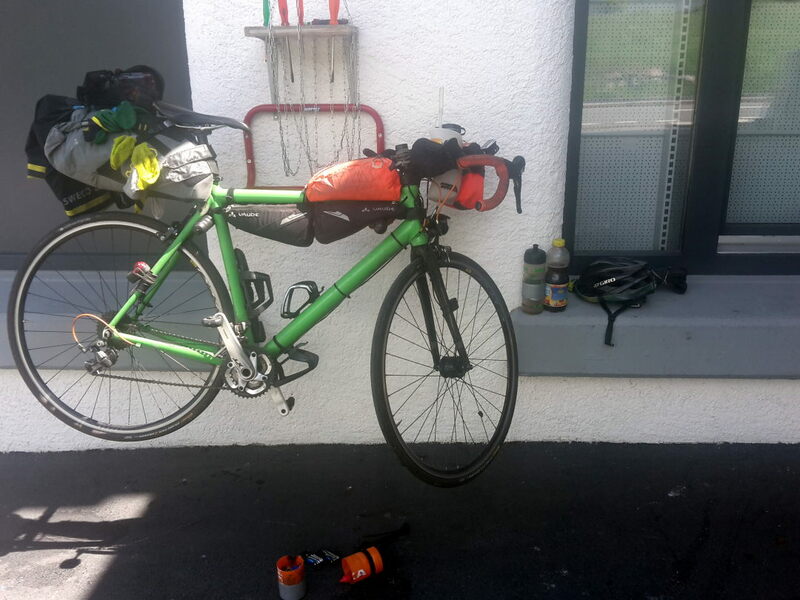 After trading all of my Swiss cash for Haribos and ice cream inside the station, I made use of the rack and gave my bike the first proper inspection after 1.500km of riding. Luckily there wasn’t much work needed, besides some fine tuning the gears and some drops of lube, so I set out again soon after. As soon as the steepest section of the downhill ended, I faced a stiff headwind. My original route followed the main road of the valley 50km till Meran where I would join into the next valley, and from the looks of it all of those kilometers would be on open road with no shelter from the wind. However, on past trips I had made good experiences with the cycle path network in Southern Tyrol, and the map showed that the bike path would run through the forests and orchards, where the vegetation would hopefully protect me from the worst of the winds. With these conditions it wouldn’t even matter if the bike path had unnecessary detours or some slower non-paved sections, as long as I could stay out of the wind. The change in plans lived up to its promises and I spent the early evening weaving through hundreds of recreational cyclists at speeds higher than what would have been possible on the road. 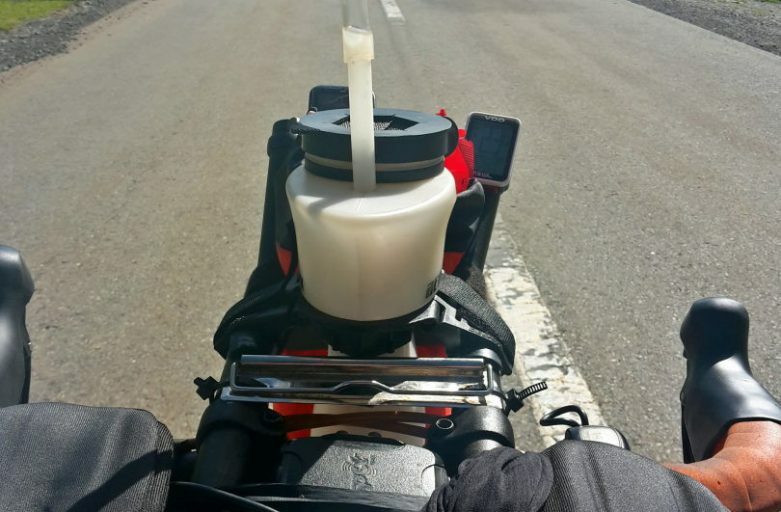 As soon as I reached known territory, the worries in the back of my mind about navigation and potential problems with the route stopped, motivating me to keep on pushing till I arrived in Bozen. I met Elia in a restaurant for a Pizza (well, actually two Pizzas in my case), topping this phenomenal day off with awesome food and nice company. 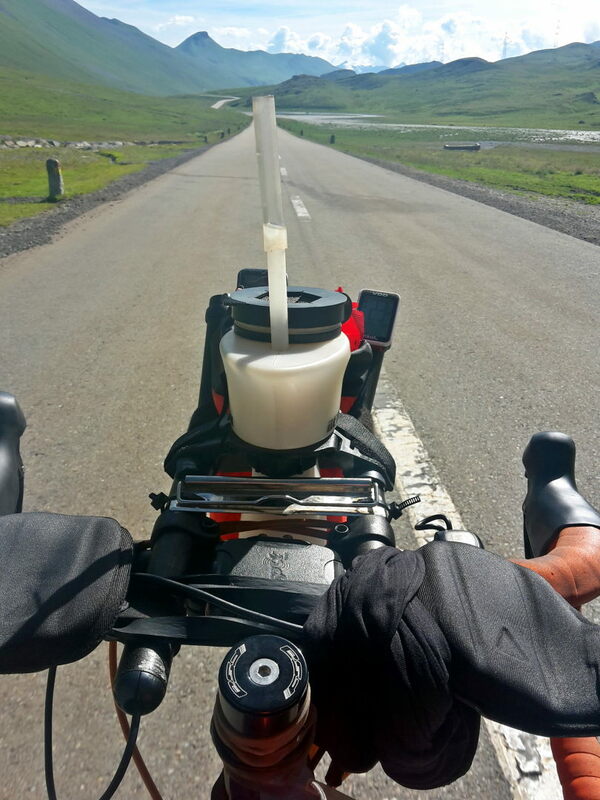 Since I was still ahead of schedule, I allowed myself to chat with him for over 2.5 hours, whilst also taking care of all the electronics: Recharging batteries, downloading maps and buying Chris Boardmans Audiobook I heard about in the podcast earlier. This allowed me to start into the night with so much fresh energy, that I decided to tackle the beginning of the upcoming big climbs. The third checkpoint was in the heart of the Dolomites, so tomorrow would be the last day of serious uphill, before I would finally steer clear of the Alps. I rode the beautiful bike path out of Bolzano, which follows an old railway, mostly separated from the loads of traffic coming from the Brenner Pass. Thanks to my scouting trip a couple weeks earlier, I already had an idea of where I wanted to sleep: Some partially torn down cabins in the forest not far from the road provided me with ample opportunities to air out all my clothes. From one of the cabins only the wooden floor remained, making for an unusual flat and level sleeping spot compared to the usual amount of roots sticking out of the ground. It didn’t last long before I feel asleep, satisfied with the day and the whole situation in general. An undefined time later I got woken rather suddenly, without having a clue what exactly woke me up. I looked and listend around, trying to determine what the reason was, but couldn’t find anything, so I lied back down. Before I could fully fall asleep again, bright flashes of light made me jump out of my bivy, fearing that someone had found my camp. Only when the thunder rolled over me did I realize that a storm was approaching, judging from the sounds a fairly big one too. My first thought upon this fact sinking into my still sleep-drunk brain? “Better go pee, before it starts to rain”. In theory not a bad decision, in practice it might have been more important to put all the hung up clothes back into their waterproof bags, and maybe look for better shelter. But as it was, I didn’t even have the time to finish peeing before huge and heavy raindrops started falling. It became obvious that my bivy bag alone wouldn’t stand a chance against this downpour and it was too late to run for cover, so trying to stay dry as best as I could I rummaged through my bags, looking for the emergency blanket. I then used it as a tarp over the bivy bag, hoping it would keep the rain out. In the end the wooden floor probably saved me from having to sleep in the mud, since the water drained quickly through the cracks in the panels, and I was able to sleep through the rest of the storm.